It is clear from reading McKinsey Global Institute’s (MGI) report, Big data: The next frontier for innovation, competition, and productivity, that big data is now recognized as an important factor of production, alongside labor and capital. Most by now recognize that leaders in every sector will have to grapple with the implications of big data. What does this mean for design and construction? MGI studied big data in five domains—healthcare in the United States, the public sector in Europe, retail in the United States, and manufacturing and personal-location data globally. Big data can generate value in each domain. 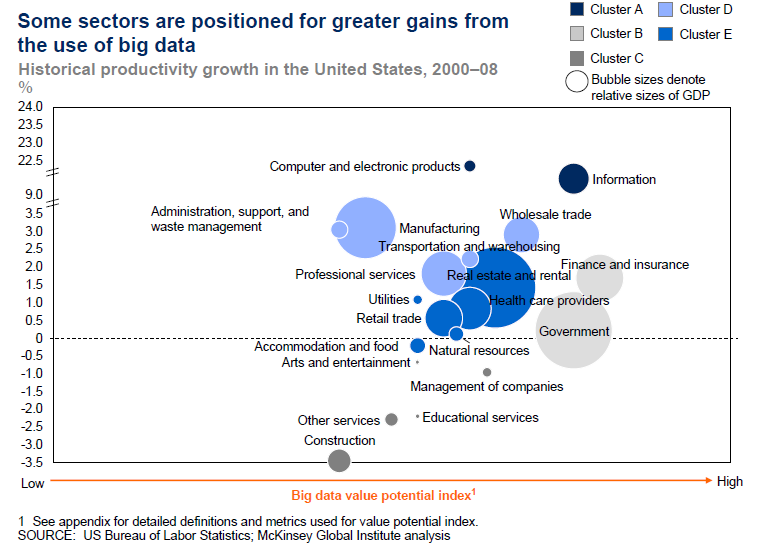 Some sectors are positioned for greater gains from the use of big data than others. And, as one might expect, the Construction sector has some work to do if it is to see comparable gains brought about by capturing, analyzing and applying big data. On MGI’s Big data value potential index, the construction sector falls somewhere in the middle of the horizontal continuum, between low and high potential value. On the vertical portion of the chart, measuring productivity growth in the US between 2000-2008, it will come as no surprise that the AEC is not productive – registering the lowest growth of any industry. In fact, as stated in the report, several sectors, including construction, educational services, and arts and entertainment, have posted negative productivity growth, which probably indicates that these sectors face strong systemic barriers to increasing productivity. One of the goals for using big data in the AEC industry is to help – along with the use of BIM, collaborative workflows and integrated delivery methods – improve productivity for owners. Adding value while reducing waste. 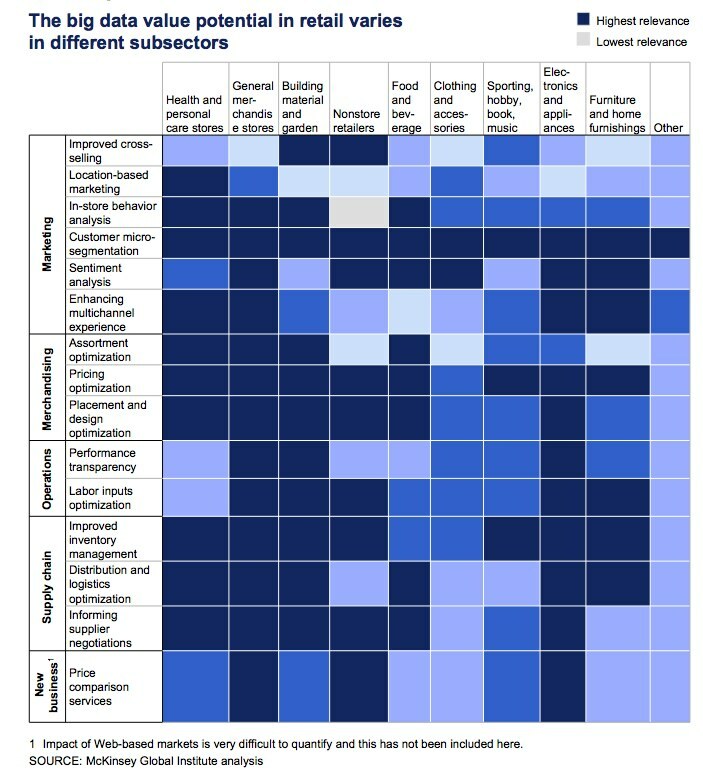 A heat map in the MGI report shows the relative ease of capturing the value potential across sectors. Construction appears on the chart as a good – not a service – and one that is not particularly easy to capture the value potential of big data. AEC talent, according to the chart, is hard to come by – not a lot of data scientists working in the architecture, engineering and construction space. What the chart calls a “data-driven mindset” also registers a medium rating for the AEC industry. And lastly, data availability is also neither easy nor hard to capture. According to the MGI report, Construction has the least stored data of any industry: 51 Petabytes (as of 2009) compared with 966 Petabytes for Manufacturing and 848 Petabytes for Government. The stored data per firm is among the lowest as well. In terms of the type of data generated and stored (it varies by sector) Construction – as one would expect – has most of its data in the form of images; next, in text and numbers; and the least amount of data stored in video and audio. The report recognizes that the use of big data in advanced simulations can reduce the number of production- and construction-drawing changes as well as the cost of construction. Also noted is the fact that construction equipment manufacturers currently embed sensors in their products, providing granular real-time data about utilization and usage patterns, enabling these manufacturers to improve demand forecasts as well as their future product development. On a larger scale, the report points out that urban planners can benefit significantly from the analysis of personal location data. Decisions that can be improved by analyzing such data include infrastructure, highway design and mass-transit construction. We are also less transaction-intensive. The research offers seven key insights. Read more here. uses data on the construction industry from 2000-2008. Had the report included data from 2009-2014, while work had slowed significantly due to the economy, the industry has made significant inroads into adopting and implementing technology in the past half decade. looks at the construction industry independent of architecture and engineering. It is hard to tell from the report whether architecture and engineering would be included in real estate, in arts or professional services. If the latter, it has somewhat better prospects in terms of available talent and IT use. Productivity in the AEC industry ought to increase in the near term, when new technologies such as building information modeling (BIM), collaborative work processes such as integrated project delivery (IPD), lean construction, and now – data – are used seamlessly and comprehensively throughout design, construction and building lifecycle. Do you agree that embedding data in our processes will increase our productivity? Sam Miller, a partner at LMN, addresses the age-old question of productivity versus performance, where Productivity = your output on a certain task or achievement per unit of time; whereas, Performance = the quality of your work; achievement versus some benchmark. Randy, spot on. As architecture firms drive out those interested in connecting design, construction and client driven data to services, clients are doing the opposite – especially in retail where big data is driving processes from capital planning to store rollout/renovation and management.